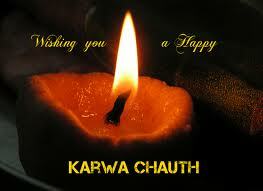 Karwa Chauth(Karwa Chauth Vrat) is Coming on 2 November and Ashwin Month's Chauth(Day of Four). Karva Chauth' is the festival observed by the married women of our country. It is celebrated for ensuring wedded bliss and wishing long life for their husbands and children. 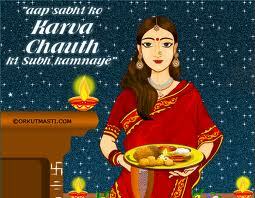 A married woman who observes this vrat or fast is called' Saubhagyavati' (joyous and happy state of wifehood). 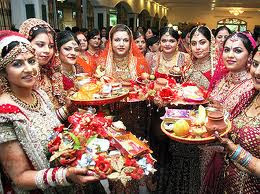 It is one of the most famous fasts among the Indian married women. 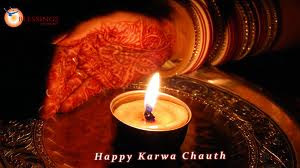 The fast of Karva Chauth is of particular importance to Hindu women as they believe it ensures the well-being, prosperity and longevity of their husbands. 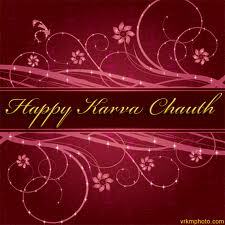 The origin of this festival was based on a very noble idea. 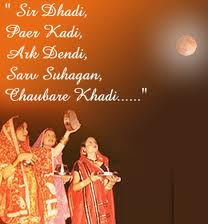 Though this idea has lost its true sense as today the whole outlook of this festival has changed. 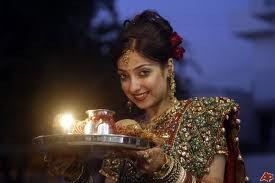 This Hindu festival has a cultural and social significance. 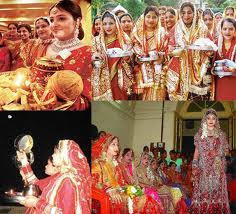 It is mostly celebrated in the northern part of India with great enthusiasm. 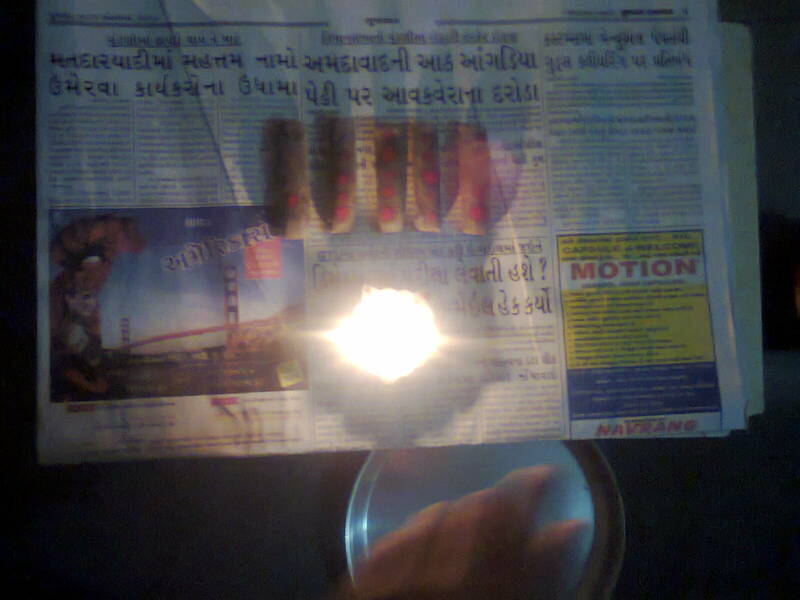 On this day woman apply mehendi (henna) on their hands and worships the moon. 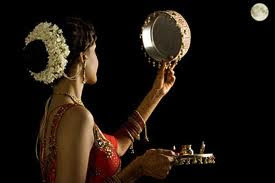 The festival of Karva Chauth has an extraordinary observance rate among married Hindu women in the northern part of India in places like Punjab, Rajasthan, Uttar Pradesh and Gujarat. 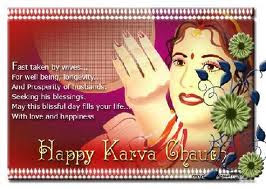 On this day married women keep a fast for the well-being and long life of their husbands. 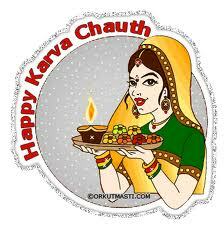 The celebration of Karva Chauth varies from region to region depending on the culture and traditions of that state. 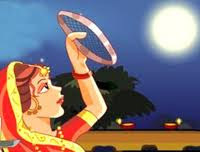 Karva Chauth is observed on the fourth day of the dark fortnight of Ashwin, which is also called Kartik according to some calendars. 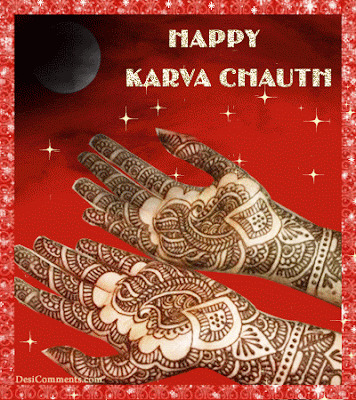 There are various traditions and rituals associated with the celebration of Karva Chauth. 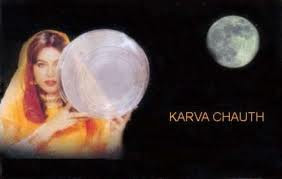 The important rituals involving the festival include worshipping 'karvas' spherical clay pots with symbols for married women and sweets. 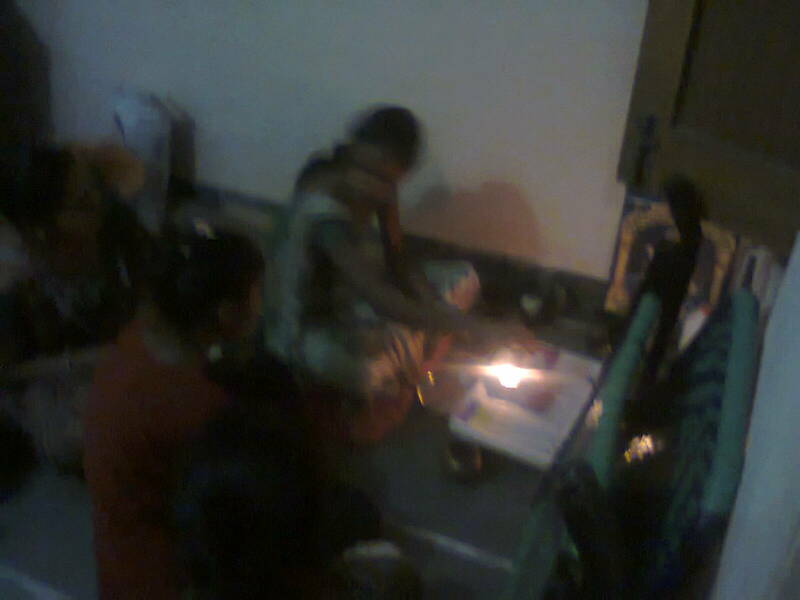 They are later exchanged with other married women. 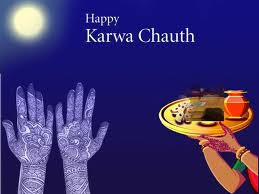 People observe fasts all days long, then worship the 'karva' and the elderly woman of the family narrates the legend of Karva Chauth (the narration of Vrata Katha). 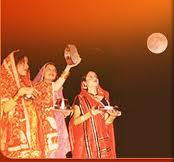 Then they wait for the moon to rise and as soon as the moon is sighted, prayers are offered to the moon. 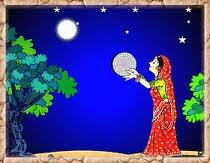 The fasting women first observe the moon through a sieve and then break their fast. 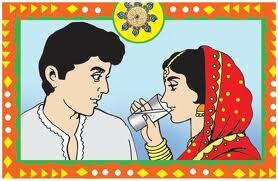 The first sip of water and the first bite of food are offered by the husband. Later on sumptuous dinner is served as a part of the celebration. 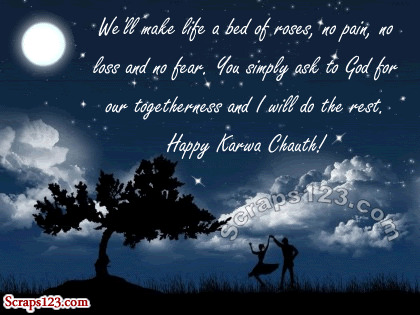 Dear husband, wishing for a long and happy life for you. 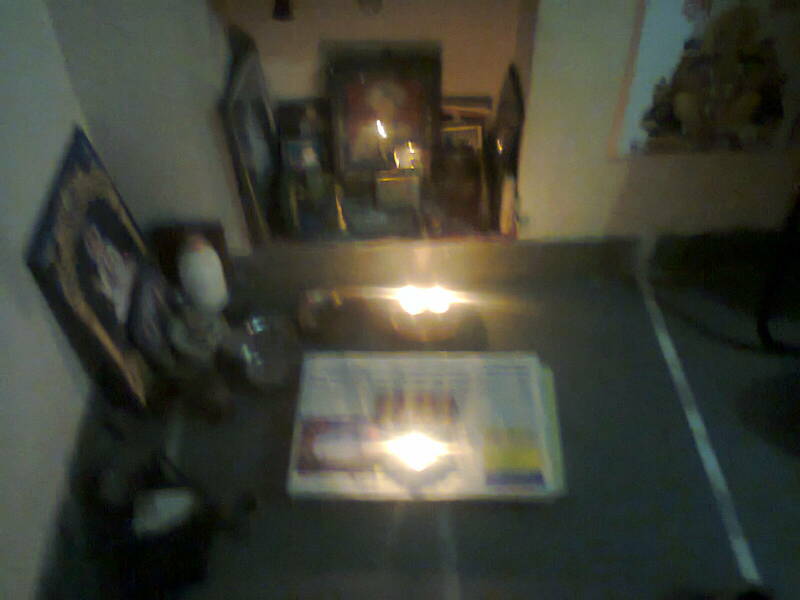 A life that we both will cherish together for years to come. 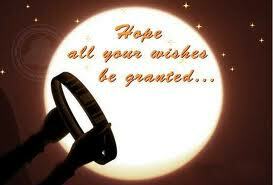 The moon is shining brightly.. The festive mood is all around.. But you are so far away..